Panahi Y, Kianpour P, Mohtashami R, et al. Artichoke has been valued since ancient times as a choleretic and diuretic agent. It contains a biologically-active constituent known as cynarin, which stimulates urination and the production of bile, a key compound for digestion and stool formation, but also for breaking down cholesterol, thus helping prevent gallstones. Other compounds in artichoke that support overall health are caffeoylquinic acids, which also boast hypocholesterolemic, liver-stimulating, and diuretic effects. Although artichoke is highly regarded for promoting liver health and treating digestive disorders, scientific research has been inconclusive about the medicinal benefits of its compounds for the treatment of chronic liver diseases. However, this double‐blind trial, published in the Phytotherapy Research journal (2018), may be a game changer for those who suffer from non-alcoholic fatty liver disease (NAFLD). Whereas non‐alcoholic fatty liver disease (NAFLD) is related to metabolic syndrome, it equally affects obese and non-obese individuals, with a prevalence of 20-30% in the western world. This chronic condition is potentially treatable, but there are few pharmacological alternatives available. Knowing that artichoke leaf extract (ALE) has shown potential as an hepatoprotective agent, a team of investigators recruited 100 volunteers, all diagnosed with NAFLD, for a randomized double‐blind placebo‐controlled parallel‐group trial. They were randomly given 600 mg of artichoke leaf extract or a placebo for two months, and their response was monitored by liver ultrasound and blood tests. From the 90 volunteers that completed the trial, 49 were given artichoke leaf extract and 41 received a placebo. 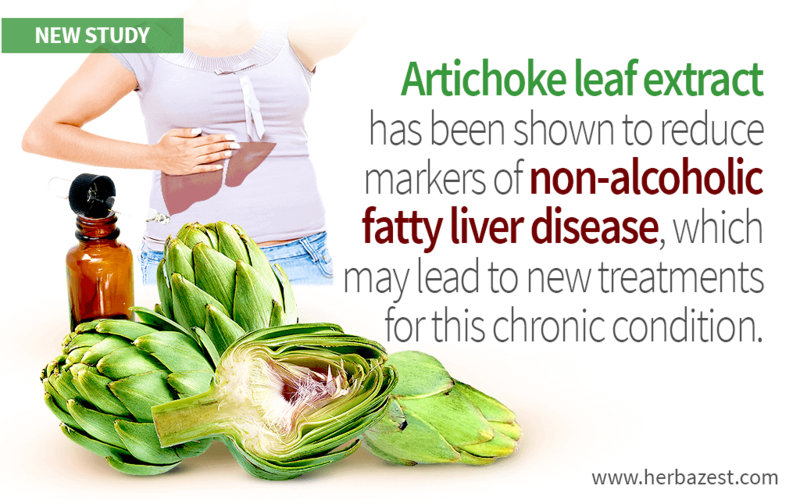 None of them reported any side effects; however, the tests showed an improved liver function in the patients who received the artichoke leaf extract, including an increased blood flow through the hepatic veins, as well as a reduction in liver size and hepatic markers in blood samples, with lower levels of total bilirubin, total cholesterol, and triglycerides. The relevance of this study lies in the conclusive evidence that artichoke is not only effective as a preventative, complementary folk remedy, but its leaf extract holds the potential for the creation of new treatments, proven that it can substantially improve the condition of patients with non-alcoholic liver disease. It is worth to mention that other popular herbs for liver health are boldo, dandelion, and milk thistle.